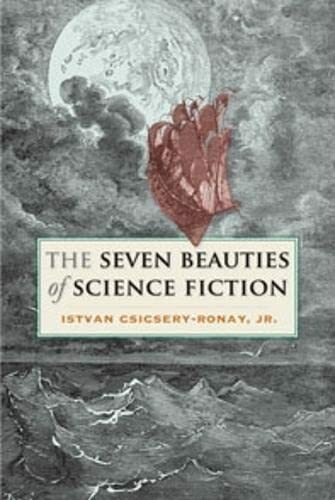 In a year well supplied with detailed and long-considered critical accounts of SF, Csicsery-Ronay's The Seven Beauties of Science Fiction is by far the most substantial, most important and most thought-provoking. If some of the thoughts provoked (in this reviewer's mind, at any rate) were "but I don't agree... " that, in itself, is a point of strength in a book of unusual range, insight, intelligence and ambition. The strength, specifically, is the hospitality of Csicsery-Ronay's critical idiom to debate. He advances a series of compelling readings of SF, deliberately avoiding a monolithic overall line, at no point either dogmatic or blinkered. Indeed, the book is so multi-faceted, and the critical intelligence on display is so nimble and perceptive, that much of it simply defuses disagreement. That I did disagree, from time to time, has as much to do with a kind of academic differend, one of those, to outsiders, doubtless endlessly tedious scholastic points of disputation that characterize much academic discourse. And even here I should note, at the start of this review, that I thought Csicsery-Ronay's decision to orchestrate his critical enquiry in a deliberately fluid manner, under seven headings that occasionally overlap and in some cases don't line up, a rather brilliant move. He resists the temptation to be seduced by, or to try and seduce others with, a single mythos of this enormously, prolifically heterogenous genre. Nor does this designedly looser architectonic result in an ill-disciplined or sloppy book; quite the reverse. More, having mentioned academic disputation I should also note that that Csicsery-Ronay's theoretical perspective—fundamentally Marxist and historicist, taking SF as "a product of the convergence of social-historical forces that had led to the current global hegemony of technoscience" as well as "a ludic framework" (p. 10)—is also, to a large extent, my theoretic bias. Nevertheless I want to try and use this review to articulate a sense of why occasional disagreement with this brilliant book might add up to more than mere reviewerish nitpicking. But I can't think of a single text by (say) Dickens, Tolstoy or Zola in which the represented material world of the novel is not in dialogue with cultural axioms. To think otherwise is surely to mistake the cultural logic of literary signification for (as it might be) documentary. Indeed, given the number of critics and fans who desire the subordination of SF texts to one particular inert and monolithic "material limit"—science itself—it seemed to me that Csicsery-Ronay's statement would be more consonant with much current SF criticism if turned on its head. He's too canny for such crudeness, of course; but there remains a sense that he uses "ludic" slightly too broadly, as a get-out-of-jail-free card rather than a precise term of analysis. This in turn speaks to the extent to which SF can be separated from (always ludic, always historicized) art more generally. Step back to the first "beauty," "Neologies": new words , the fictive languages of the genre (as it might be: "ansible," "warp drive" and "grok"; but also recontextualisations of more familiar terms—"in Jeff Noon's Vurt (1993) an illegal alien is an extraterrestrial creature from the Vurt," p. 22). Again, this chapter is convincingly worked, intellectually deft and full of penetrating analysis. Csicsery-Ronay wants to argue that "readers understand realistic stories of everyday terrestrial life by recognizing references to known experience. SF readers, by contrast, actively supply imaginary new referents that will give rational meaning to the implied science-fictional neosemes" (p. 22). I don't think this is right on either count, actually. Language in use is as much phatic and (in a broader sense) performative, as it is referential. One of the interesting things about watching a Shakespearian play is precisely that you don't need to know what all the words actually mean to enjoy the play (in the case of some terms, not even scholars are sure: being unable to parse Macbeth's "tomorrow and tomorrow and tomorrow" speech exactly in terms of its referential content, surprisingly perhaps, does not diminish the power of the speech). Reading Cervantes, or Zola, or Tagore will throw a great many unfamiliar terms the reader's way; but trying to pin down their referentiality (for instance; by repeatedly flipping to the footnotes at the back) tends to degrade the reading experience. Csicsery-Ronay's sensitive reading of the way the neosemy of Herbert's Dune (specifically the "Arabic" sounding vocabulary of the Fremen) puts in play cultural attitudes to actual Arab countries and discourses is well done: but the chapter ends inconclusively with frank bafflement at the popularity of Klingon. "Why," he wonders, "are so many Americans, otherwise notoriously reluctant to learn others' languages, enthusiastic about an imaginary tongue with no history or social context other than fan conventions and a set of revered, though often contradictory, mass-media texts?" (p. 45) He doesn't answer his own question—doesn't, for instance, take the obvious next step of suggesting that maybe it's precisely because Klingon has no history or social context that people are drawn to it. " Hamlet ," he notes, has been "'translated' into Klingon" (p. 45). I wondered why he deploys those scare quotes. I don't want to get bogged down on this point. Csicsery-Ronay is surely right to suggest that "the intelligibility of such words does not depend upon social changes in usage, but in their ability to evoke imaginary differences of culture and consciousness" (p. 19). But surely such evocations tend to function precisely outside the realm of "intelligibility." The broader point would be something like: we don't know, can't know and actually don't need to know what all those little bumps and nodules on the Millennium Falcon actually do ... their purpose is not referentiality, even ludic referentiality, except insofar as their very existence buys us into a particular semiotic. Language, especially in this context, works the same way. The question is not "what does Klaatu barada nikto actually mean?" It is, rather, how does this phrase work, as whole, semiotically. What do the lyrics on Magma's fine SF albums connote? (Csicsery-Ronay, to his credit, gestures towards music as an important and under-studied SF discourse, although apart from one footnote he doesn't go any further than the gesture). The answer, I suspect, is that in both cases they connote SF, and nothing more. Let me try and be more precise about my general point. Csicsery-Ronay's book parses the "beauties" of science fiction, coherently and rigorously, precisely in terms of their intelligibility—their cultural and discursive intelligibility as much as their specific denotations, but the rational dimensions of the mode. But it seems to me (I accept that this looks a little counter-intuitive, given the supposed relationship of the genre to the acme of rationalist discourses, "science") that intelligibility of this sort is very far from being central to SF. Csicsery-Ronay's stress on the "ludic" aspect of the genre addresses this, except that games are played by rules, and understanding such rules is a large part of what his study is doing. My disagreement here (and I disagree with just about everything in that quoted passage, pretty much down to the commas and full stops) goes to the heart of what I'm trying to say, although by the same token it's worth noting that most critics of the genre, I'd hazard, would agree with Csicsery-Ronay's position. Csicsery-Ronay notes that certain contemporary theorists ("Jameson, Lyotard, Žižek") have privileged a new postmodern understanding of "the Sublime" in their thought, but adds "for this context (these theories) may be too general to be of use," (p. 284). I disagree. Now, it really would extend this review unconscionably to itemise the minutiae of this particular disagreement. Fortunately we can stargate through those barren wastes to a simple-enough conclusion: Csicsery-Ronay is unpersuaded by various poststructuralist and postmodern theoretical perspectives. It seems to me, on the other hand, that these are the critical idioms that give us the tools precisely to look at the ways "sense of wonder does indeed lend itself to critical analysis," although doing so may corrode the viability of assertions such as "sf is certainly a literature of ideas," "a sense is not a concept" and "wonder, even less so." There seems to me an awkwardness in applying Kant (even Csicsery-Ronay concedes he is "somewhat dusty with age") to the rather unKantian flux of contemporary SF. So when Csicsery-Ronay asserts "in a sense, the SF sublime has become a 'realistic' discourse" (p. 161) this seems to me plain wrong—insofar, that is to say, that I don't suppose the scare quotes around "realistic," there, bracket the term in with Lacan (wholly absent from Csicsery-Ronay's index). The point is that, precisely to the extent that sense-of-wonder Sublimity is about the Real, it can never be "realistic." Of course we might wonder what we're to do with that fantastic creature even more at odds with scientific reason that a big bug, the divinus omniopotentia itself. Bringing in a thousand-year-dead monk seemed to me a strange way of making Csicsery-Ronay's broader point about the downgrading of scientific (which is to say, rational) implausibility: "The ants, the dinosaurs, the demonoid aliens are then merely the displacements of unconscious popular anxieties" (p. 144). To which I can't help but reply: merely? Isn't this precisely the same game as any externalization of unconscious popular fears or desires?—as it might be, the enormous phallic jouissance of a Saturn V launch, attack ships on fire off the shoulder of Orion, the existential liberation of wandering around World of Warcraft ... but I don't need to multiply entities here. I'm just reiterating the differend between Professor Csicsery-Ronay and myself: which is to say, what I would prioritise the textual (or discursive ) ground of all the narratives in which he is interested, and do so in a way that stressed its monstrous or excessive joissance. One consequence of Csicsery-Ronay's particular perspective is that alternate history gets fairly short shrift, relegated to a few pages in the discussion of the third beauty, "Future History," and even there prefaced by a rather awkward admission that "alternate histories fit uncomfortably in the category of future history" (p. 102). The idea that SF as a whole is precisely a mode of alternate history clearly isn't congenial to him, although it seems to me there's a case to be made. SF, he notes, relates future events in the past tense ("Unlike real prophecies, SF's are narrated in the past tense. They don't pretend to predict a future, but to explain a future past" p. 76;) and he speculates what a SF text might look like if it were written in a future tense. I can think of at least one novel written (a third of it, at any rate) in the future tense; but this is not necessarily to disagree with his opinion, that "sustained for hundreds of pages readers will surely lose patience" (p. 77). From the "future past" of SF's future history we might, of course, draw a conclusion—familiar from SF criticism—that SF's apparent future narratives are actually about the past: that Star Wars is WW2 in space, Dune a medieval story and so on. Csicsery-Ronay won't have this: for him futurity is the ground of SF. He takes a similar line on steampunk, which he thinks "not so much counterfactual as ... counterfictional" (p. 108)—that is to say, a gloss upon textual rather than historical reality (Gibson and Sterling's Difference Engine "is accessed through the looking glass of Dickens"). I might counter that all history is textual, nor is there an outside-text ("actual fact") where we can stand to apprehend the nineteenth-century; which surely positions the counterfictional as the paradigm for all such fantastic extrapolation. He would be under no obligation, of course, to accede to my premises. The chapter on the fourth beauty, "Imaginary Science," is much more persuasive: Csicsery-Ronay is surely right that "sf has always engaged scientific ideas and speculations in order to affirm the freedom of the artistic imagination from the constraints of deterministic and oppressively systematic ideas. Exaggeratedly rationalistic theories ignore SF's fundamentally playful performance of scientific thinking" (p. 112); although perhaps he later overstates the case (asserting, pace Delany: "the science of SF must violate known science if it is to be science-fictional" p. 128). The sixth beauty. "The Science-Fictional Grotesque," is similarly excellent: parsing the genre via "the giant Rabelaisian body" (something that pushed exactly the right buttons for me) and Bakthin's carnivalesque-grotesque, and bringing in all manner of excessive, monstrous and liminal entities. Csicsery-Ronay gives his seventh beauty the distinctly uneuphonious moniker "Technologiade," a neologism formed after the manner of "Robinsonade" and meaning "the epic of the struggle surrounding the transformation of the cosmos into a technological regime" (p. 217). This again occasions a wealth of perceptive critical insight, although in part the chapter is given over to a lengthy and not wholly convincing structuralist attempt to reify a set of categorical figures: "the Handy Man" (oddly for a writer as attuned to the way social class determines cultural tropes, he identifies the aristocratic Odysseus as the emblematic version of this artisanal archetype), "The Fertile Corpse" (the "scene of the Handy Man's performance" apparently), "The Willing Slave" (Crusoe's "Man Friday"), "The Shadow Mage," "The Tool Text" and "The Wife at Home." This whole schema seemed to me a little arthritic, especially compared to the mercurial way Csicsery-Ronay's critical intelligence engages the specificity of SF texts in the rest of the study. His coda (it is wittily, or pretentiously—take your pick—entitled "Concluding Unscientific Postscript") identifies the Singularity as the, as it were, vanishing point of these various lines of critical thinking; which may be a canny move, or may come to look really rather dated in ten years time. In sum: it has been a long time since I have read a work of SF criticism that has engaged me so heartily, or demonstrated so impressive a grasp of the genre and the critical issues, as this one. Anyone interested in the field will want to take notice of it. I spotted no actual factual errors, although there are a few places where statements are less than precise (as, for instance, the assertion that Riddley Walker is set "in east England" (p. 33), or the styling of Wells's invisible man as an evolutionary mutant [p. 90]) and on p. 238 Mercier's L'An 2440 becomes "2445." But these, in so lengthy a study, are sunspots so petty as barely to be worth registering. One last note, on the question of style. Gwyneth Jones's admiring words, quoted on the back jacket ("this remarkable book is full of fascinating ideas, resolutely stripped of academic jargon...") are a little misleading: the style is always crisp, even lapidary, but layers of academic jargon remain assuredly un stripped: "the parable space in question differs from Delany's concept of paraspace in that the latter is a diegetic alternative domain set off from diegetic 'mundane' worlds, while the former is nondiegetic" (p. 275). This isn't a problem in itself: the book is a major intervention into the field of serious study of SF, and the professional idiom will not alienate academics, although the general reader may find it hard going. "current global hegemony of technoscience"
Is that like the Starfleet Academy? Where can I join up?